One Million iPads Sold in 28 Days, Shall We Call it a Success Now? Barring any doubts that you may have on Apple’s intent for announcing this remarkable feat achieved by the iPad, we could not escape the fact that indeed this new Apple product has reached the pinnacle of success. Alright, call me an Apple fanboy. I wouldn’t mind it, but you can’t stop me from proclaiming that the iPad is a big success for Apple. First, let’s lay down the numbers. One million iPads sold in 28 days just for the U.S. market alone. Well of course you can also count in the thousands of iPads which slipped out of the country and landed into the hands of scalpels in Asia or those who are resourceful enough to get the iPad the legit way. 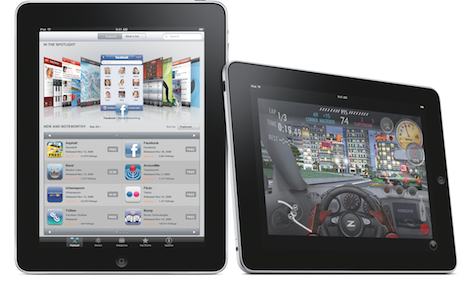 Next, iPad users have downloaded over 12 million apps out of the current 5,000+ available apps from the App Store. Plus 1.5 million ebooks bought from the iBookstore. According to Steve Jobs – “Demand continues to exceed supply and we’re working hard to get this magical product into the hands of even more customers.” And I couldn’t agree more. There shouldn’t be no doubt in our minds right now as to whether Apple was successful with its new product venture. By all means – Yes, the iPad is a big success! Non-US Apple fanboys who were not brave enough to import the iPad into their countries are still eagerly awaiting for the end of May, the date when Apple promised to deliver the iPad to the international market. Â While those who went out of their way to get the iPad on their hands are probably thinking of getting the iPad 3G right now Â as some folks have confirmed that it will work with international SIM. One million iPads sold. Do you have one of these one million iPads? Or perhaps more than one? Believe it or not, the Apple iPad is selling like hotcakes in some Asian countries despite the fact that it is not yet officially available in those countries. PC World, via Yahoo News is reporting that the iPad appears to be selling well in Asia despite the fact that Apple’s official release won’t be happening until end of May. 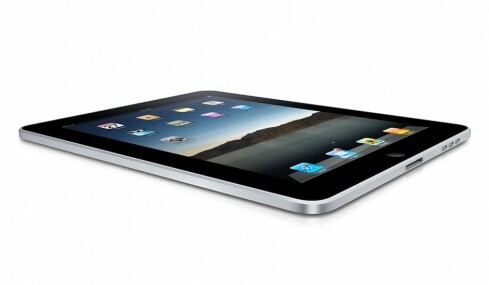 The report also mentioned about two stores near Taipei’s main electronic Bazaar which are both selling iPad units. And guess what, the two stores are not even competing with each other so much so that one doesn’t even need to lower the iPad’s price. Â No matter how pricey the mark up they put on the iPad, it will still sell – like hotcakes. In fact, the store owners want to buy some more because demand is becoming too much as against the supply. Any idea how much these two stores in Taipei are selling the iPad? Hold your breath folks because the 16GB iPad WiFi sells for around $800, $925 for the 32GB WiFi and $1,020 for the 64GB. In Apple Store U.S. , the prices of these iPads are only $499, $599 and $699. Interestingly, despite the unavailability of official distributorship, estimates of iPads sold outside the U.S. are already around tens of thousands. What’s even more surprising is the fact that Asians still buy the iPad despite some possible setbacks of having an unofficially released iPad. Â For one thing, there will be no available technician and in case they encounter problems with their iPad, they have no choice but to send it back to Apple. Aside from Taipei? Where else could the iPad has possibly arrived? In the country where I am right now, there are probably less than 500 owners of the iPad right now. Over at the Daily Bits, I was just discussing about how the iPad can possibly kill the Amazon Kindle, partly because of Â the iPad’s rich, colorful display as against the Kindle’s boring grey e-ink display. You want another proof? How about checking the iPad App Store and searching for Kindle for iPad? Yes folks, Amazon’s Kindle for iPad app is now part of the growing list of early iPad apps releases just in time for the release of the iPad tomorrow. And boy does it look’s awesome? Indeed! Just take a look at the sample screenshots provided on the app’s page on the iPad App Store. 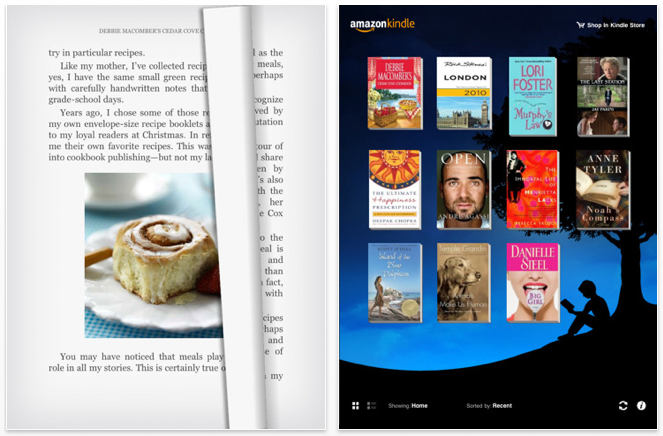 Kindle for iPad features a rich, colorful, and vibrant main app page. Displaying book covers in full color against the old-familiar blue Kindle theme. Feature-wise, it’s pretty much the same Kindle mobile app for the iPhone, BlackBerry, Mac and PC. Kindle for iPad also supports Amazon’s Whispersync that automatically syncs your last page read , bookmark, notes, and highlights across all of your devices. Â The app also lets you purchase e-books from the Kindle Bookstore which you can also use these e-books on your other Kindle apps. Obviously, Kindle for App does not recommend the iBookstore so it’s either you use Kindle for iPad or the iBooks from getting your e-book fix on your iPad. Wall Street Journal is also diving into the iPad frenzy with a not-so-hard to reject offer for iPad owners. 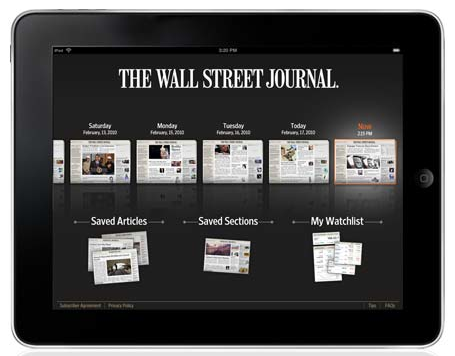 A monthly subscription to the Wall Street Journal delivered to your iPad for a whooping $17.89 monthly fee. So what do you get after paying that amount? In addition to the freely available WSJ content such as top articles and market data, the paid subscription model to WSJ will also give you access to subscriber-only content including Business and Markets, access to 7-day downloadable archive, personalization and saving features. Sounds good, right? Â Indeed, it is if you’re daily news fare rely heavily on the Wall Street Journal. But as Engadget noted, it may not seem to be cheaper offer though. This is because of the fact that it would only cost you $11.65 to subscribe to both print and online versions of WSJ. Still, if you don’t mind spending that much for the rightful access to Wall Street Journal Premium content delivered to your brand new iPad, the WSJ iPad subscription seems like a good offer. Â I mean, can you just imagine the envy of your colleagues as you read the WSJ from your iPad while waiting for the board meeting to start? You’re earning more than enough anyway so that extra cost shouldn’t matter. So, what are you waiting for, subscribe to the Wall Street Journal via the iPad now. Click this link to get you started.